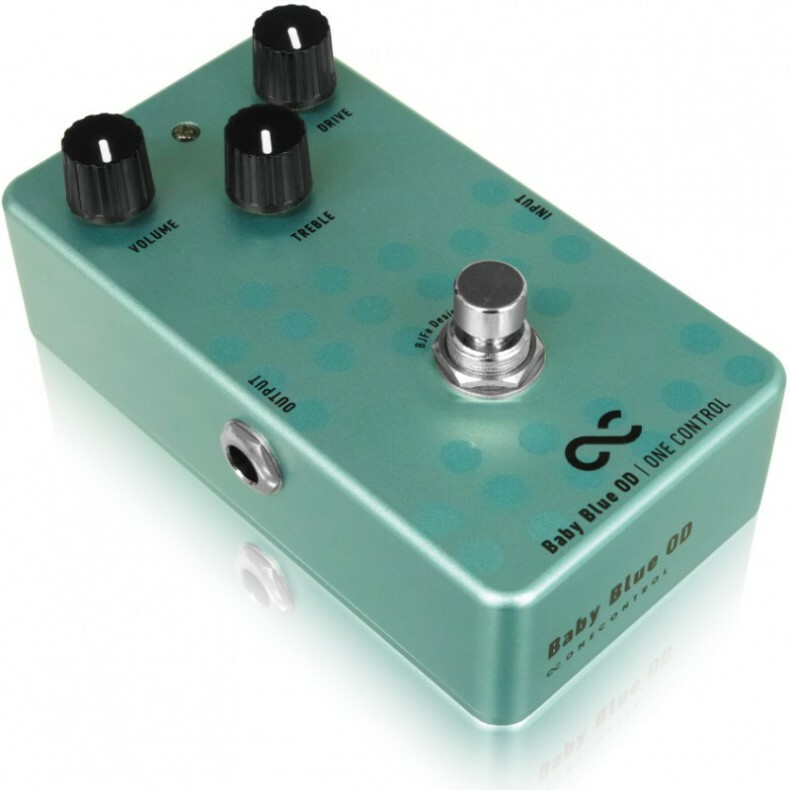 Designed by pedal guru Bjorn Juhl (BJF/BJFe), the One Control Baby Blue Overdrive is based on the BJFe creation FUZZ 1 (originally released in 2000), utilizing a discrete circuit that combines dynamic overdrive and fuzz. 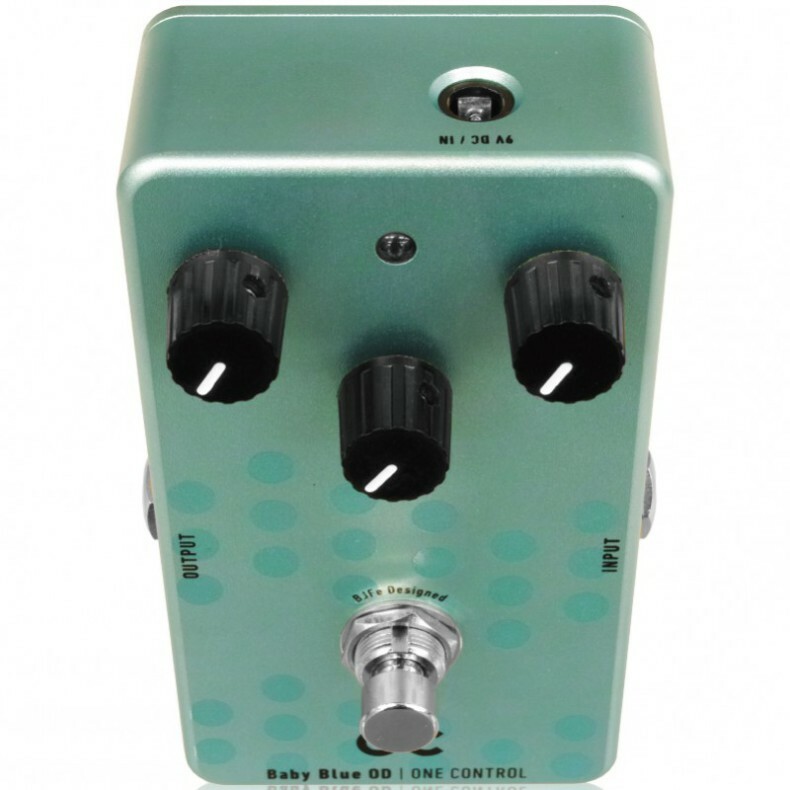 The Baby Blue OD produces sublime tone at reduced rhythm volumes as well as cranked up lead output, whether set to a low gain clean, or a saturated wall of sound. Often compared to the most sought after boutique American style tube amplifier, the Baby Blue OD utilizes the finest modern components, painstakingly selected and tuned by Bjorn Juhl himself, to produce this classic, NOS sound. Drive: Set the type/character of distortion. At lower settings, it delivers softer distortion. 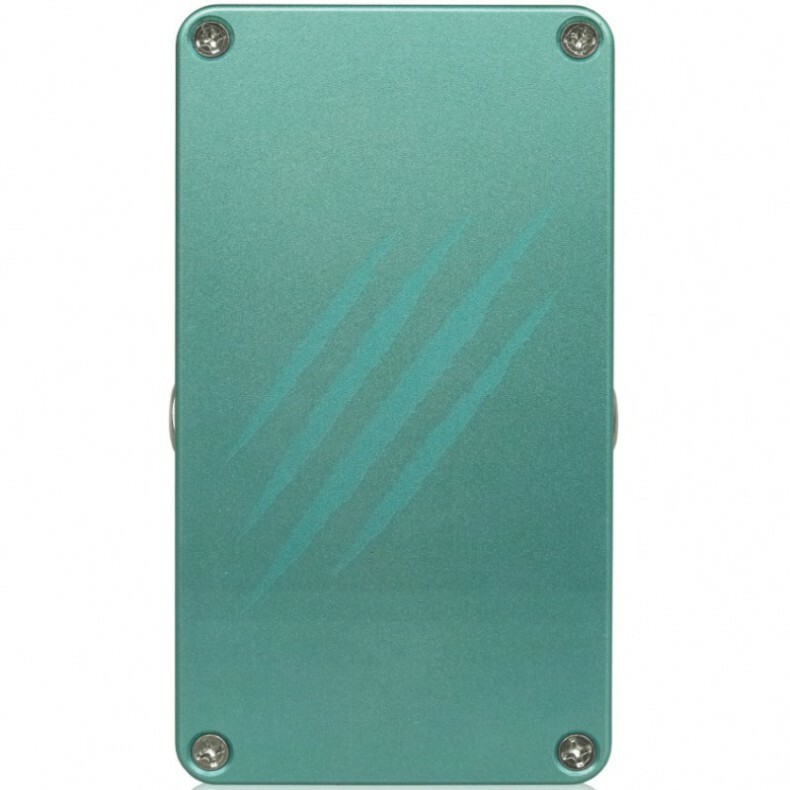 At higher settings, the tone is more compressed, with more sustain. Treble: Adjusts the high frequency component of the output signal. The response is high, so depending on your setup, you may find the best results with the control dialed quite low. Start around noon and dial back if too bright. OC will release a BJF classic and the first model produced by BJF the Baby Blue Overdrive. I have checked the prototype and am very pleased. 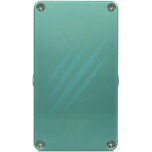 BBOD was made in two versions the intial version and the version 2. Version 2 gave the circuit twice the output and lessened the influence of loading-first version sound was dependent on where the volume controls was set. The One Control version is made with modern parts that are as close as it gets to the parts originally used. So the OC BBOD is an entry in the debatte of wether it is possible to make surfacemount SMD versions of circuits believed to only be possible with vintage components-my answer is SMD is not a limitation but it requires you know your parts and have a factory that is responsive and respectful and above average skills to pull things off and I’d say I care less where such a factory is located as long as they can make exact and at high quality control. In this business there is a whole lot of mojo stating gear can only sound great with vintage parts and in vintage designs but if one were to look at vintage sounds or really just great sounds and define a great sound in functions then it becomes a question of techniques and parts available for large productions as I see it. Anyway it is my pleasure to be able to present the very first BJF model ever made now to be available in large quantaties. BBOD was discontiued for production at an even 500 units partly from lack of parts but also because BBOD was BJF’s most controversial model, while sometime after some more parts were found as I got the keys to an electronics surplus store’s cellar and about 300 more units were made without any advertising but also those are parts are now coming to an end. Therefore it makes me extra happy to be able to present a modern version that has the vintage sounds. It was the most controversial model I ever made because there were many reviews but they were almost like for different models and because while most of my models combine in any order this model was designed to go specifically closest to guitar.When I first showed BBOD I felt it was a fuzz but my distributer said it was an overdrive. Others said it was the closest thing to a Dumble sound. It was also said you cannot appreciate the BBOD unless you can play good enough. I made this model as an answer to a couple of newly baked technicians that years before in the dead of night sat and listened to waveforms from waveform generators and they decided uneven period time square wave was the most musical and so I kept that in mind and years later I had a technical answer on how to realize uneven period time square wave and that could be controlled by picking force- some would say uneven period time square wave doesn’t exist….but it’s really quite common though some would give this waveform another name. I will say that after these changes ( and yes things change with surface mount-capacitances and one will just need to be aware) this version of Baby Blue OD may be the best ever made and the closest to the sound and playability I had in mind for this circuit upon designing it. 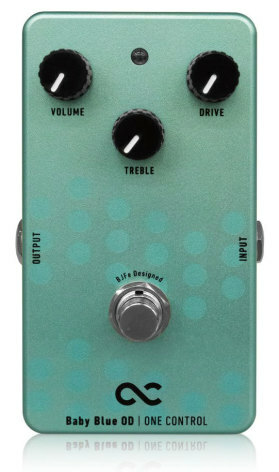 When this circuit was first shown as a product in October the year 2000 I had named it fuzz because that is what it technically is, but the then distributer to come later in 2000 told fuzzes don’t sell so product must be renamed Overdrive because that is closer to what it sounds like. This is a circuit of fairly heavy gain enough to play hard rock on ,while it can also do overdriven amplifier sounds with Drive set lower. 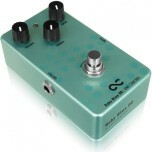 To my mind overdrive as an effect applied to electric guitar is a device that can increase distortion of an already distorted amplifier-that is what it was in the 70’s and the idea was to increase distortion mainly in the midrange since most amplifiers at the time could produce heavy bass and bright treble but usually not sufficient sustain in the midrange. Yes this is a treble heavy fairly densly distorted sound-modelled after amplifiers that would not distort nicely in any other register than treble and so it is a sound that is more that of an overdriven amplifier than that of a device designed to overdrive amplifiers. This is a circuit that many would argue it would be impossible to make in SMD technique and impossible to replicate on a large scale- simply because the originals were made of selected vintage components- I would be proud to say that it is fully possible and it only comes down to the skill level of the factory. While I would say perhaps there are few factories that can pull this off. It is a controvery though that the BJF version was made with vintage parts and the OC version is made with modern smd parts-some would say it is not possible to get the same sound but I profess it is fully possible.